I love the thought of being able to refashion clothes. The ability to take something from drab to fab is so inviting to me. I have to be totally honest though; it scares me to death. I decided I just better jump in and get started. I have a lot of old clothes just lying around, I have a hard time throwing anything away, just ask my husband. 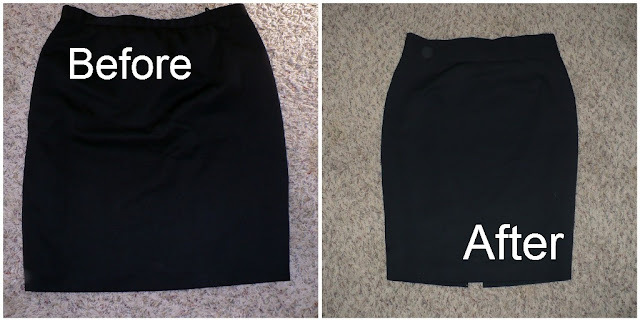 Since this was my first time refashioning, I decided to start with something easy. I am actually really proud of how it turned out. 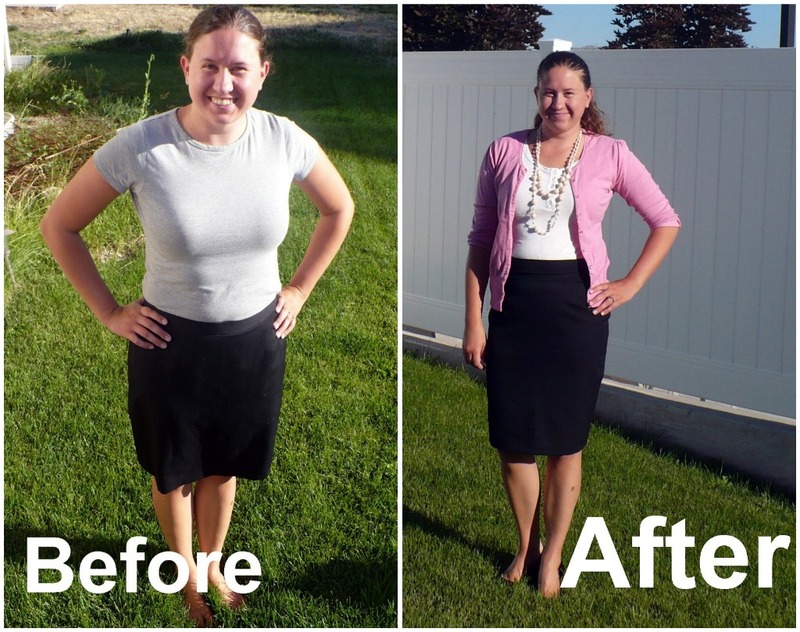 It is hard to see in the before picture just how awful and out of date this skirt was. I originally got this skirt out of a pile of clothes my great aunt was getting rid of. It was part of a suit set. She had at least three skirts just like this. I took them all thinking I would use pieces from all of them. I tapered the sides by at least 1.5"
For the waistband I cut a strip off the bottom of one of the other black skirts measuring 6". I sewed the right side to the front of the skirt and ironed it at 2.5" toward the inside of the skirt so I had a thick waistband. ﻿I added three buttons on the back. Since I just took off the waistband I didn't need to add a zipper or change that at all, yay! ﻿Now I have a brand new little black skirt that cost me absolutely nothing. It only took me three hours for everything. I am sure once I am more experienced I will be able to be faster. Have you ever refashioned anything? Any tips? Also as a side note, my sister is getting married in a year and we are on the look out for a thrifted wedding dress to refashion. If anyone sees one or has any tips for how to refashion a wedding dress please let me know!! Love this post because I could be the author, as I too, love to refashion but scared to death of doing so. You took the plunge and your remake is great - looks like an expensive new skirt. Thanks for this post. Dang woman you are looking hawt! Oh and the skirt isn't too bad either. Love it! Love you! Looks great! Much improved.I think you can rest your fears, you did it! You can have my wedding dress. Carlee and I both wore it, but it's only from 2005 so not exactly vintage. Great job on the skirt - I love the high waisted look! wow, way better after! love the pink sweater too. i have lots of sewing ideas, but never seem to get them done. bravo to you! Adorable. I love the other pieces you added to the outfit also.